This year Rainford Tennis Club received 13 pairs of tickets from the LTA for our members to attend The Championships at Wimbledon. 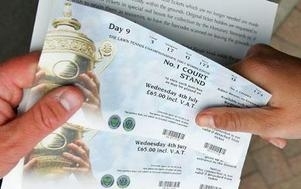 Following a ballot, members have purchased tickets to enjoy matches on Centre Court, No. 1 Court and Court 2 throughout the tournament. "There are many benefits to becoming a member of Rainford Tennis Club" said Club Treasurer, Linda Collins. "Having access to Wimbledon tickets is one of those benefits and we hope our members have a great time at The Championships."